Wednesday, we scurried around the office and the house, in that order, trying to get the last details attended that would permit Bonnie and me to make our exit from Winona, MS for our fall mission trip to Asia. We didn’t get everything done, not the least of which was to mow the grass. Well, it’s already high from weeks gone by, and I guess it’ll be there when we get back. Surely, it will stop growing soon as we approach a change in the weather. We had our last supper at our favorite restaurant, the Texas Roadhouse; Rebecca joined us there on her way home from work – teaching school in Horn Lake, MS. I had my usual – road kill – a glorified and well-seasoned chopped steak, a salad and a baked potato. Rolls and peanuts accent the atmosphere. Having arrived about 30 minutes before the restaurant was open and before Rebecca was free from teaching school, we got gasoline (40 cents per gallon cheaper than back in Winona), an oil change (slightly past due) for the van and the complimentary car wash. After we ate, we bought some last minute things for the two month trip overseas on which we were about to embark. Being Wednesday and being in Collierville with our daughter, we attended the Collierville Church of Christ. We received a lot of well-wishing and encouragement for our Thursday morning departure. Back at Rebecca’s home, we tried to take care of final matters (e.g., emails, Internet check-in for our flights and printing our boarding passes). Off to bed about 11:00 p.m. I was hoping for a good rest, but I suppose the impending trip kept us from sustained and restful slumber. Thursday morning saw us slalom through Memphis Interstate traffic to the airport. A slight hiccup at the check in counter, though three of the four bags to be checked were well under the allowed weight, one piece of luggage was about four pounds overweight. Always before, in every airport we have ever visited, the combined weight of all the bags was calculated against the weight allowance. Not this time, though, which required us to move some things around from one bag to two other bags (the other bag already headed down the conveyor and was not available) that were bulging to the max. Even though both of our carryon bags were spacy inside, we did not dare put anything in them because when we reached Singapore Airlines, they require no more than 7 kg or 15 pounds (the case weighs half that) – and the agent at Singapore Airlines weighed my carryon baggage. The trip to Los Angeles was pleasant, and Bonnie and I did manage to sit with one another. We have been traveling companions through life for over 38 years now – and we want to continue that way as long as God permits. Always before, we have crossed to or from the West Coast at night, but this time we could view the scenery. We took the southwest air route – roughly following I-40 most of the way. It crossed my mind that the pilot was merely following the highway, maybe using a roadmap! We didn’t see much green, but scorched earth – in part, doubtless due to the hostile, burning summer without rain that this part of the country has experienced this year. Of course, the rugged mountains explain some of the scattered settlement of portions of that region. Hmm! I might have to grant Mississippi some accolades. LAX lived up to and surpassed past experiences, being the most painful airport experience we endure anywhere we go on the planet. Stages of construction and destruction were everywhere! Hardly any signs or personnel could be found to get around. Unlike other international airports, one has to leave the terminal altogether – dumped on the street and fend for himself. One errant bus ride, finally boarding the correct bus and much walking, we found our way to the international terminal. Lines, lines and more lines – endless lines. Then, when we finally arrived (over two hours early) at the seating area for our flight, the only eatery was a Samuel Adams pub. Not interested in the booze, neither were we desperate enough to pay $13 or $14 for a cold, premade lunch meat sandwich. We had a cereal bar apiece for breakfast on the way to the Memphis airport, and we feasted on the same, plus we split a package of cheese and crackers. Finally aboard our plane, an A380-800 – the biggest commercial airliner in the world, we were able to utilize the three seats in our row on our side of the aisle – because the plane was sparsely occupied. Other than a little turbulence occasionally and reduced legroom, it was like being in our living room – it reminded me of small theater seating. Pretty nice, actually. However, wouldn’t you know it, the nice, personal video screen malfunctioned, and for a while I thought I would have to forego the distraction of inflight entertainment to help pass the 11 and a half hours between LAX and our refueling stop in Tokyo, Japan. Did I mention that the plane has two decks? Naturally, we had to deplane in Tokyo, go through security once more and reboard the same plane, this time for Singapore. Aloft, Bonnie and I both got some sleep at different times. Bonnie read a book through that she borrowed from our daughter. We watched some movies – on the way to Tokyo from Los Angeles and from Tokyo to Singapore. Even the biggest commercial jetliner gets tossed about sometimes by turbulence, we can attest. However, as big as it is, the pilots set that big bird down easy – easier than many of the smaller craft on which we ride. Around 3 a.m. Singapore time, we landed. To our dismay, our favorite airport of anywhere that we go shuts down its transit trains at 2:30 a.m. In Terminal 3, we had to make our way by foot – lugging our portable office (computers) and carryon bags. The problem, though, was all of the signs are geared for directing transfer customers to the appropriate transit trains, and nowhere – absolutely nowhere – are there signs directing pedestrians to Terminal 2. Men don’t like to do this, but I finally found a policeman in the nearly ghostly empty airport who gladly pointed us in the correct direction. The usually bustling airport cafes and other retailers were almost all closed. We found a couple of croissants with egg, cheese and bacon, accompanied by a Diet Coke and tater rounds; I had no idea that Turkey bacon could be so tough! Our bodies say that it is the middle of the afternoon when the local clocks say that is very, very early in the morning; I would have been happy with a Whopper, but the two Burger Kings we happened by had no beef offerings at this hour of their day. Waiting patiently is a very important, acquired characteristic that is very useful in foreign travel. We are waiting again – this time for the security to open separating us from our departure gate. This is the morning of the third day since we left Memphis, TN. 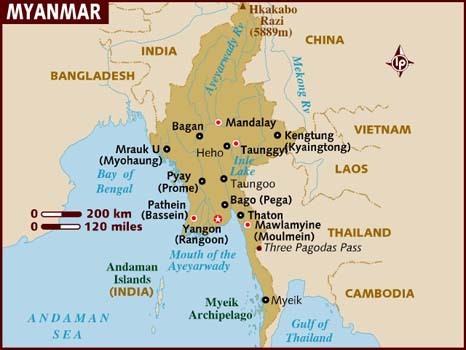 We have only lingered long enough in airports for the next plane to fly us on toward Yangon, Myanmar (Burma). We have been wearing the same clothes all this time, and we have another four hours or so before reaching Yangon, sometime after which we may be able to clean up and change clothes. We have not brushed our teeth in days, and my personal body odor is so repulsive to me that I can’t stand to smell myself. My unshaven face has become prickly even to me. Then, days from now and for about eight weeks, we will be out in the sun and mostly away from AC and shower facilities; sometimes it’s going to get worse before it gets better. Cutting through the thick clouds on our descent to Yangon provided us one of the bumpiest rides we have ever experienced; we were glad that the clouds gave way eventually and were not all together from sky to ground. At 9:30 a.m. Yangon, Myanmar time, we arrived at the international terminal, and once we cleared immigration, recovered our baggage and processed through customs, we were greeted by several dear brethren. No place on the planet do we receive a warmer reception than from our loved ones in the faith in Burma. Some of these brethren had to travel several miles for about an hour on the back of pickup trucks to be in place to receive us! Tired, yes! Dirty, “Yes!” Smelly, “Yes!” Time for showers and rest, “No!” Not more than checked in and getting our luggage to our hotel room, it was off to downtown to purchase airplane tickets for our movement within Myanmar over the next two weeks or so. Since we were downtown, we exchanged currency and made some purchases at Scott’s Market. I love Scott’s Market, and I could stay hours if we had time – just so I could thoroughly look at everything. Each year, we buy some gifts for family and friends, and we buy carved wooden or jade animals and purchase some jade bracelets or necklaces to offer as tokens of hospitality to brethren Stateside who lodge or feed us as we travel in our country weekly. It seemed like it took forever to get the airplane tickets arranged for Bonnie and me as well as for our two nationals traveling at different times with us. Our “girl Friday” and dear sister in Christ also reserved hotels for us along our upcoming trip and handled related details in advance of our arrival to those places. Finally, we were able to shower and take a nap. It was a struggle to decide on napping longer or go to supper with dear sisters; we went to supper. Besides we needed to stay up as long as possible to force our bodies to more quickly adapt to the new time zone in which we found ourselves – 12 times zones away from home – nearly completely opposite day and night between where we live and being in Myanmar. We went to bed early, slept well and long! By the time we slumbered Saturday night, we had been up since early Thursday morning; to say we were bushed would be an understatement. Comments: Comments Off on Burma Bound! The picture accompanying this blog entry is of the stuff that we lug around to make presentations and offer published literature to brethren; this is a comparatively small contingent of stuff this time. 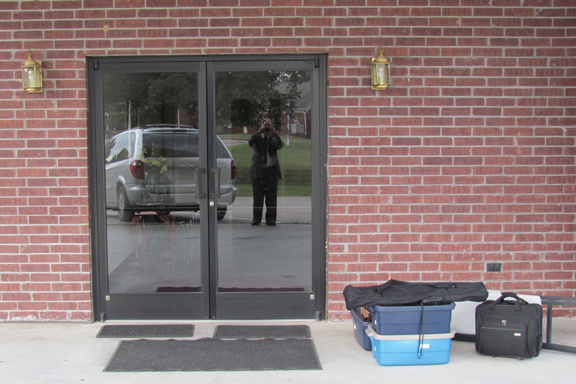 I didn’t plan it this way, but notice the reflection in the doors of the meetinghouse; there I am snapping the picture, and our silver minivan appears behind me. Sunday morning, Bonnie and I were pleased to worship once more with the East Memphis Church of Christ. A small congregation wanting to grow numerically, it is graced with some enthusiastic Christians. Robert Williams and his son Ruben serve as ministers at East Memphis. For Bible class, I presented the PowerPoint Motivated by the Cross of Jesus, and for worship I preached What Is Jesus’ Plan for My Life? After services, several of the members expressed interest in some of the Bible-related books that we took along. Brother Robert and sister Helen Williams treated Bonnie and me to a pleasant and savory lunch at Chow Time. Bonnie experienced somewhat of a wardrobe malfunction at East Memphis; her skirt split, revealing the underskirt or lining. With some time on our hands between Sunday appointments, we stopped at J.C. Penny’s in Horn Lake/Southaven, MS where we selected a couple of nice outfits for Bonnie. Fortunately, they were on sale, and they compliment and complement my dear wife more than the skirt that tore. 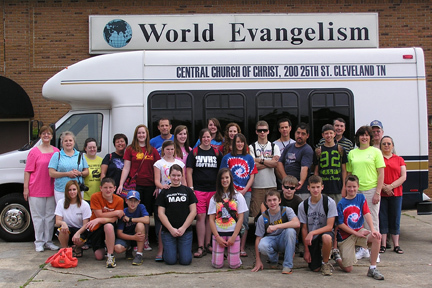 Next, we arrived in Charleston, MS for our evening appointment with the Charleston Church of Christ. Arriving early, we stopped at McDonalds – or tried to, but it was closing for the installation of new cash registers. There was a time when transactions could occur without computer aided devices, but not today! Sunday evening, I presented Motivated by the Cross of Jesus. Robert Rawson preaches for the congregation; usually when I speak there, brother Rawson is away. This small congregation always receives us well and helps us financially in our mission work. To know these brethren as well as the support they offer us is heartening and enables us to do what we do. The plane tickets for our foreign travel arrived in our mailbox Friday morning – not a moment too soon since we leave for Asia Thursday morning of next week. Today, though we were on another trip – eight hours driving between Winona, MS and Nashville, TN and then back to Memphis, TN. Whew! I’m tuckered out. 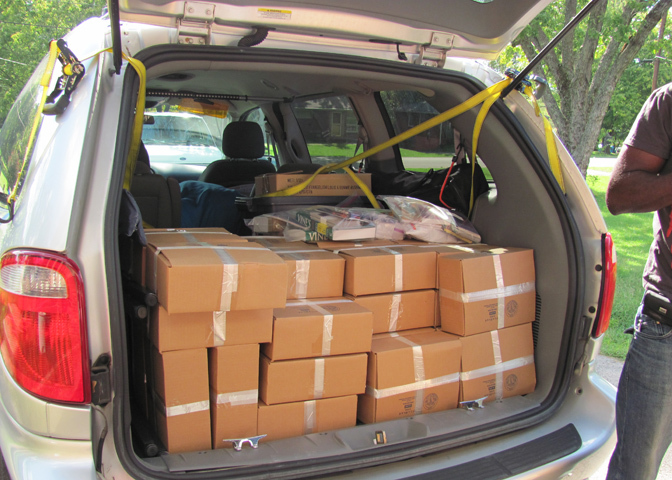 Yesterday, Bonnie and I loaded the van with about 500 pounds of books and The Voice of Truth International magazines ultimately for brethren in Guyana, South America; today, we drove them to Nashville and packed them into an 18 cubic foot box. It will actually ship in the middle of October, but Bonnie and I will already be in Asia; it will go by boat and arrive the first or second week of November. Saturday, we will help Rebecca around her house (yard work). Turnabout is fair play, since she has helped us from time to time at our residence in Winona. Sunday morning, I have a speaking appointment with a congregation in Memphis, and for the evening I will be speaking in Charleston, MS. Monday and Tuesday, Bonnie and I will try to finish preparation of our lessons for overseas classes and pack. Wednesday, we will drive back to Collierville, TN to spend the night with Rebecca, and she will take us to the airport on her way to work Thursday. Three days later, we will arrive in Yangon, Myanmar. After several weeks there, we will fly to India where we will be for about four weeks, after which, we will fly to Colombo, Sri Lanka. Bonnie and I are scheduled to arrive back in the USA on November 21 – just before Thanksgiving. Then, we’ll be on the road again reporting to churches on the weekends (schedule your congregation now) and publishing literature weekdays. Please pray for us. Comments: Comments Off on A Ticket to Ride! Monday and Tuesday were visitor days with guests from Malawi, Georgia (USA) and India coming by the Winona office of World Evangelism. The Friday before, we met new friends and Christian brethren from northern Mississippi who, likewise, stopped by the office. In each of the cases, we gave the grand tour of the warehouse/office facilities and fed our sightseers. We provided them with their personal, empty cardboard boxes and pointed them toward the books; we have nearly 250 titles of books, about 80 tract and pamphlet titles, four issues of Global Harvest, 69 issues of The Voice of Truth International in English, and 8 issues of The Voice of Truth International in Spanish. In some instances, our visitors were lodged overnight in the home of Betty Choate and her mother Theola Burton. At other times, Jerry and Paul Bates as well as Bonnie and I lodge brethren in our homes, too. Besides these venues for lodging, we have an apartment at the warehouse/office at which we bed down guests who come to visit or work for a few days. Interest in what we do in the States and abroad that goes forth from Winona, MS heartens and encourages us. Thank you! Comments: Comments Off on Welcome Friends and Brethren! 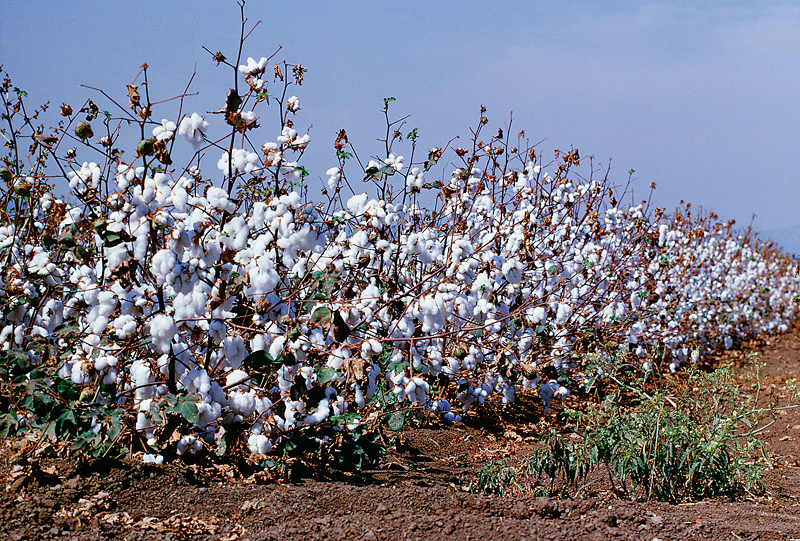 Saturday, Bonnie and I sailed the ribbons of asphalt cutting through seas of defoliated cotton and the semis burdened with ripened, golden grain, corn pickers shooting the precious grain to them. We made our way from Winona, MS to Piedmont, AL to be with the Highway 9 Church of Christ Sunday morning for class (The Three Bears of Galatians 6) and worship (Motivated by the Cross of Jesus). Peggy and Bob Rogers are so good to us, and we have been there often enough, that we simply went to our room with our luggage – down the hall, last room on the right. Nothing compares to Christian hospitality! Sunday evening, we worshipped with the Blackwater Macedonia Church of Christ near Jasper, AL. There are a lot of Central churches of Christ, North End and Eastside churches of Christ, but the moniker Blackwater Macedonia Church of Christ is both unique and has character. We were very well received, and I updated the congregation on our labors and represented the World Evangelism Team as I presented the PowerPoint Motivated by the Cross of Jesus. The late J.C. Choate and his wife Betty have been going to Blackwater Macedonia for several years, and they are fondly remembered. Unusual but appreciated, we arrived home Sunday night around 10:30 p.m. Usually, we are fortunate to arrive home by midnight, and if we are far enough away, we will not get back to Winona until Monday. This is our life: 3,000 miles by car monthly primarily on weekends to congregations of the Lord’s church, working the warehouse and keeping the stream of published literature flowing by weekday, and traveling abroad up to 50,000 air miles annually. Bonnie and I are away from home about 45 to 50 weeks per year! It is a hectic pace, and for the most part, we would not have it any other way. Please pray for us that much good in the kingdom may result from our meager efforts. 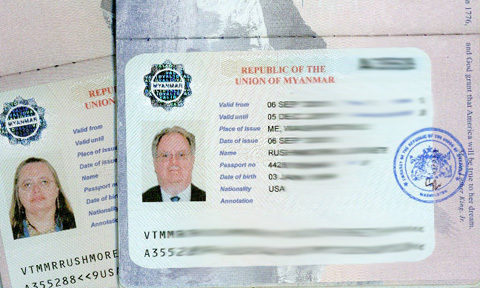 September 12, we received our visas for Myanmar. The estimated six days to process took three weeks instead. I do not buy airline tickets for destinations requiring visas until the visas are obtained since we buy non-refundable tickets. Immediately, we submitted our anticipated itinerary for Myanmar, India and Sri Lanka to our travel agent. Within a couple of days we received and confirmed the travel agency’s itinerary as well as paid for most of the airfare for this trip – a whopping $6,876! We still need to buy air plane tickets and pay for taxis (car and boat) in Myanmar. Add to these expenditures lodging, meals, program expenses, computer equipment for one of our translators and literature (including Bibles). In addition, we are carrying funds for different brethren to nationals in the countries to which we are going. Altogether, the costs for this three country trip (with stopovers in still more countries) is approaching $20,000. Bonnie and I feel a grave sense of responsibility respecting this type of an investment through us in taking the Gospel abroad, and at the same time, we have a great deal of gratitude for the Christians and congregations of the Lord’s church that make all of this possible. Now, we must finish the details this side of the ocean. We must make sure that we have our lessons adequately planned and ready. Then, we will patiently as we can endure the tedious security screenings at the airports through these 12 time zones we pass. Our tailbones will surely ache as they inevitably do as we jet across the sky westward into Asia; especially that 16 or so hour hop over the Pacific Ocean can be very wearying. It is time for the unfamiliar foods and the culture jolt as we translate ourselves from western to eastern society. Once more we will trick our bodies into thinking we are supposed to be awake when we ordinarily sleep, and to sleep when we usually are awake. I am always amazed that even in the 21st century, it still takes three days by commercial jet airplane to get to the other side of the world. We leave Memphis, TN on the morning of Thursday, September 29, and we arrive back in the States on November 21. Gospel Gazette Online will be late, and other matters will simply have to wait for our return. We trust that all will go well and that we will be able to glorify God and edify souls, beginning with our own. Comments: Comments Off on Plucking the Money Tree! Friday, September 9, Bonnie and I left the Winona office a little after noon, threw some clothes in a suitcase and headed for Batesville, AR. Four and a half hours of driving and one brief bathroom break later, we checked into the Best Western Scenic View motel; it overlooks the city hundreds of feet below, accessed by the 25 mph snaking curve. Usually, Bonnie rides along to appointments where I will be speaking, and sometimes we are both speakers at a lectureship, for instance. This Saturday, though, Bonnie was speaking in a Ladies’ Inspiration Day, and I was tagging along with her (as the designated driver, though she volunteered to share some of the driving). Bonnie’s lesson was entitled “Two Mrs. P’s: Polar Opposites.” She taught about the unnamed Bible characters of Mrs. Peter and Mrs. Potiphar, contrasting their attributes. This type of a lesson also emphasizes the difference between Bible reading and Bible study; studying the Bible is more productive ultimately than Bible reading alone. Her presentation was a combination of two chapters in her new book Living Principles: Gleanings from Unnamed and Named Bible Characters. Approximately 76 sisters in Christ from several congregations attended. You may desire to schedule Bonnie for a future Ladies’ Inspiration Day or other ladies’ lectures or classes; you may reach her at Bonnie@gospelgazette.com. You may also contact Bonnie if you are interested in acquiring her book Living Principles at the reduced, special price of $5.00 plus shipping and packaging. See other ladies’ class books, among hundreds of Bible study books at, http://store.gospelgazette.com/.